SPRING VALLEY, Minn. (July18) – (Photo courtesy of Gulbranson Photo) They give trophies to Little League champions too, but the best of the best the planet has to offer square off every October in the World Series to determine the undisputed greatest that the sport of baseball ha s to offer. In less than 1,000 days and nights, the World Modified Dirt Track Championship presented by Bauer Built Tire and Hanson Tire Service has solidified itself as the “who’s who” event for open-wheel dirt modified racing, and the answer to this universal question will be answered sometime next Saturday night. Set for Wednesday-Saturday, July 24-27, the third annual blockbuster event will award a whopping $20,000 to the winner and no less than $1,500 to each of the 31 main event starters. While most of the event’s format and itinerary remain the same as the last two WMDTC programs, fans will be treated to a spectacular championship feature race that will be 100 non-stop laps. In last year’s 75-lapper, Ryan Gustin blistered the field to take home a record $25,000 which included part of more than $30,000 in additional sponsorship money that was raised less than 24 hours before the finale. The inaugural event in 2011 went to Brad Waits of nearby Rochester, Minn., as he conquered the toughest, most talent-laden field ever compiled while driving a used chassis he acquired one week prior to the show. Race fans will witness a complete program each day. 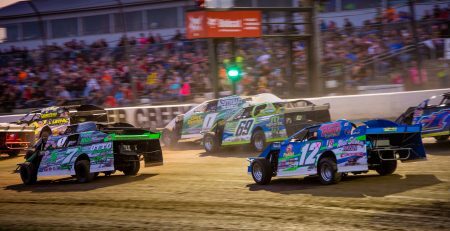 Wednesday, Thursday and Friday will feature group qualifying, heat races, last-chance races and a 35-lap main event for the USMTS Modifieds, with the top 6 in overall points each night being locked into the first six rows of Saturday’s 100-lap climax. Saturday’s show will feature an “alphabet soup” of main events as drivers try to make their way into the big dance. Joining the racing card on Wednesday and Thursday will be the Iron Man Challenge featuring USRA B-Mods on Wednesday and USRA Stock Cars on Thursday. Friday and Saturday night will feature Wissota Midwest Mods as the support class. inverted for their heat race. Heat races will take the top 12 in passing points to the “A” Main with the remainder going to one of the “B” Mains. Points will be awarded for time trials, heat races, “B” Mains and the “A” Main each night with the top 6 in points being locked into Saturday’s “A” Main. The highest overall points earner during the first three days will earn the pole for Saturday’s “A” Main, second most points in the middle of the front row, third most points on the outside of the front row and so on for the 18 qualified drivers. if a driver has some tough luck during qualifying on Wednesday, Thursday or Friday, he or she still has the chance to climb the ladder of main events on Saturday to earn a spot in the finale. The 31st starting spot will be auctioned off prior to the start of the race. Nearly $100,000 has been earmarked for Saturday’s championship main event alone, with a total purse of more than $160,000 posted for the four-day extravaganza. Each driver competing two days or more is guaranteed at least $350. Grandstand gates open at 4 p.m. and hot laps begin at 6:30 Wednesday through Friday. All times are one hour earlier on Saturday. 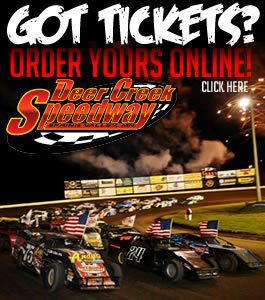 and can be ordered online at www.deercreekspeedway.com or by calling toll-free 877-327-7223. This event is sanctioned by the United States Modified Touring Series and all USMTS rules apply. No points will be awarded for this event and no license is required. Tires allowed are the American Racer KK704, stamped Hoosier G60 or Wissota Hoosier 35. The Wissota Hoosier 35 will only be permitted for licensed Wissota drivers and the racecar must be completely Wissota legal. today to ensure availability. Rates are $175 for the week for a standard cart and $250 for a four-passenger cart. Quantities are limited. Call Miner’s Outdoor & Rec at 507-583-2712 to reserve your golf cart for the week. The Deer Creek Speedway sits on 60 acres of scenic rural rolling hills with one of America’s most popular state-of-the-art racing complexes and a busy modern campground. The 3/8-mile high-banked clay oval is located 11.3 miles south of I-90 (exit 209) on US 63 (0.7 mile north of SR 16) in Spring Valley, Minn. For more info, call toll-free 877-327-7223 or 507-346-2342 on race day or visit www.deercreekspeedway.com online. To learn more about the United States Modified Touring Series, visit www.usmts.com online, like the USMTS on Facebook at www.facebook.com/usmts, follow the USMTS on Twitter at www.twitter.com/usmts or check out the USMTS YouTube channel at www.youtube.com/usmtstv.